To learn more about Ridge Haven Cono, our camp in the Midwest, click here! Our new 6,000 square-foot Celebration Lodge is less than five minutes from Ridge Haven’s main campus, atop the Continental Divide Mountain Range. Celebration Lodge is the perfect option for adult groups seeking grand, spacious, and well-appointed retreat accommodations with unbelievable mountaintop views overlooking the Blue Ridge Mountains. With beautiful hardwood floors and carpeting throughout, Celebration Lodge features six bedrooms (14 beds), all with private baths and mountain views. Two of the large bedrooms have five twin beds each, while the other four bedrooms have queen beds. The master bedroom has a walk-in closet and entrance to the porch and decks. There is an expansive living room with a huge stone fireplace that opens into the dining room, which can seat lodge guests and friends, up to 20 people. 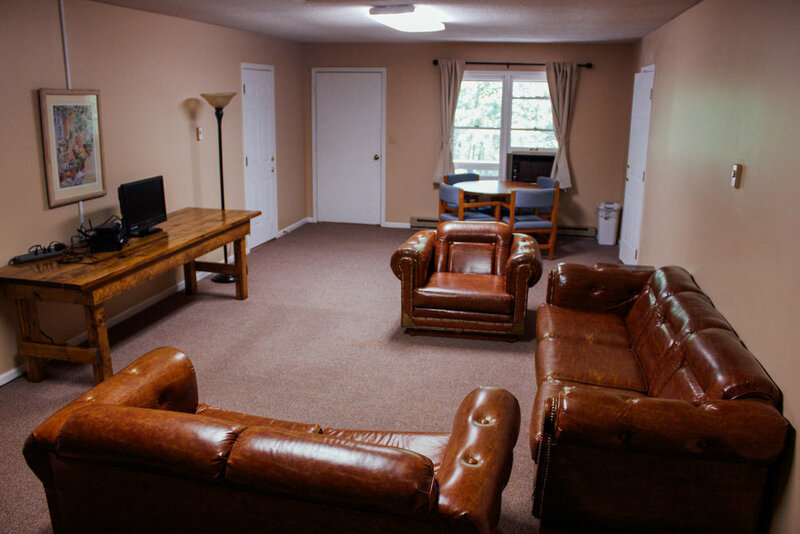 There is also a large meeting/game room with another stone fireplace and TV. The full-size kitchen has a separate breakfast room that opens onto a screened porch and multi-level decks. Guests can enjoy smart TVs, wireless internet access, and a study room. They can also arrange for a personal chef or dine at the main campus. Our guest cabins are perfect for a getaway to the mountains! With two different sized options, both of our cabins are a sweet, rustic home away from home. Both cabins have kitchens, one bathroom and a quaint living space complete with TV and wifi. Cabin 1, pictured below, has one full sized bedroom and a loft. Cabin 2, which can also be seen below, has one master bedroom and another bedroom with a bunk bed. Linens are provided. The Averett Guest Rooms are ideal for adult accommodations. There are three floors, each with eight guest rooms and a roomy lounge (see each lounge below). All lounges contain a kitchenette, satellite TV, and room to relax, but there are different ways each lounge is set up. Two lounges have fireplaces. Guests can choose from rooms with two double beds, rooms with two double beds with a bunk over one, or rooms with a queen bed and pull out sofa. All rooms have private baths and linens are provided. Ideal for families, couples, and small to medium groups of up to 40 guests, Azalea has eight private rooms upstairs that include double and twin beds. There are also four rooms downstairs with three sets of bunk beds in each providing space for 24. A meeting/lounge area with a fireplace, a screened porch, and a kitchen with limited flatware and cookware is available for use. All rooms have private baths and linens are provided in the eight private rooms upstairs. Cassels Lodge and Laurel Lodge each contain 12 rooms with two sets of bunks (four beds) in each room. Both lodges also have a lounge. All rooms upstairs open out into the lounge. Each room has a private baths. 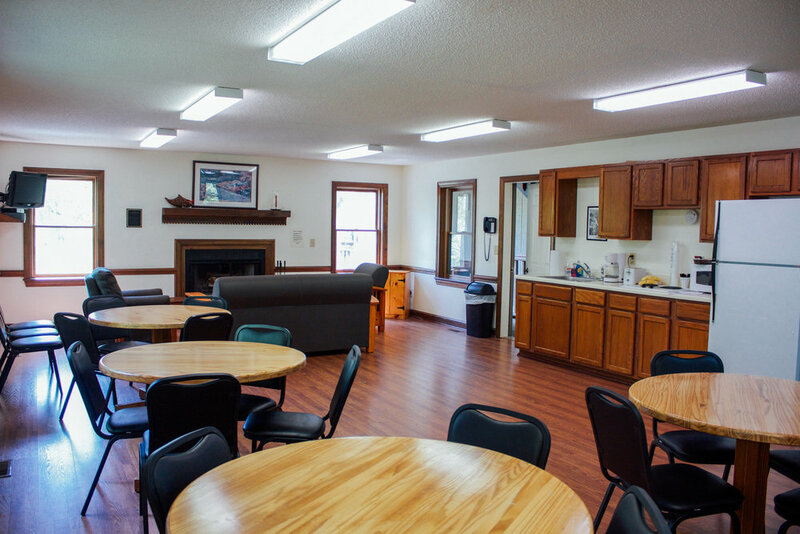 The Dean and Iverson Lodges each have six semi-private rooms and two large bunk rooms separated by a game room, totaling 64 sleeping spaces per lodge. Each lodge also includes a large kitchen, a dining space, two fireplaces, a "common" room, and a large screened-in porch. The lodge kitchens are supplied with limited cookware and serving ware. All three Bunkhouses have two floors with a total of 48 beds in each. Each upstairs has two rooms with bunks for ten separated by a common bath, then adjoining one of those rooms is a smaller room with bunks for eight. Each downstairs has two rooms with bunks for ten separated by a common bath. Each of these spacious one-bedroom apartments has a king bed, private bath, kitchenette, wireless internet, and air conditioning. Linens are provided. Roll-a-way beds and weekly rates are available.